We are a leading Wholesale Supplier of flexographic garment label printing machine with compressor, flexographic garment label printing machine and garment label printing machine from New Delhi, India. The LTX Series is an advanced version of LTRB series. It has been designed as per new market demands to improve the productivity and as well as fast changing of the jobs which could be smaller or big and the production could compete with the market price and giving the customer an edge over quality. After printing and passing through the specially designed UV dryer the printed label can meet the hardest of wash test and colour brightness/fastness. The LTX Series is suitable and one of the easiest printed label flexo machines available in the market. Fast Speed: The highest speed is up to 1 m/s; Two rolls or of materials can be printed simultaneously, greatly increasing the production efficiency. Large Solid Under Color: Large area of solid under colour printing can be performed and solid printing can be achieved. Meanwhile, the whole side can be printed with equal effect. Additional drying with infrarid heater apart from front & back drying. Fast Color: Using Special ink, dry to fast colour, the printed product features washing resistance and strong colour. The printed products can bear severe wash and stone wash. It meets the European and USA standards of environment protection and free of toxin. It can be freely used. Universal Size: Printing for tapes with different length can be performed only by changing plate cylinder. Multi-use of the machine can reduce repeated investment. 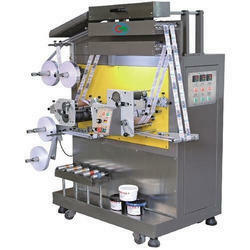 This machine suitable for materials including riband, cotton, rubber tape, nylon tape, paper tape and adhesive tape. 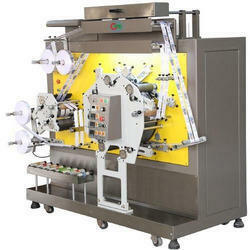 The LT- Series is a having 3 colours high-speed flexo label printing machine. it can print 2 colours on one side and 1 colour on the other side. The Anilox Rollers are high accuracy and of international high standards. Ink is transferred directly from the image plate to the textile material as it passes through the plate cylinders.After Printing and passing through the IR dryer the printed label can meet the hardest of wash test and colour brightness. 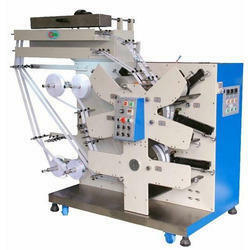 Looking for Flexographic Garment Label Printing Machine ?